When it comes to building your business's influence in the market, nothing tops consumer trust! No one eats, drinks, or buys anymore without checking online first for feedback. The world of online reviews often dictates where and how consumers will spend their money. Without 5-star status, you are losing customers before they even walk in the door. 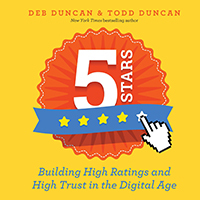 Learn to make the most of technology and develop consumer trust with our latest release, 5 Stars: Building High Ratings and High Trust in the Digital Age. With technology's many benefits (increased brand awareness, more efficient company–to–consumer communication, creative marketing opportunities) come unique challenges. Technology is now such an integral part of our lives that it can easily become a distraction. 5 Stars has all the tools you need to break unproductive habits while harnessing today's technology to create success.